A dear friend of mine works at Clear Channel Radio (which is housed in the building right across the street from where I work) and she often has access to really cool perks. A couple of months ago she got us tickets to go see Tina Fey and Steve Martin at the Nokia Live theater downtown (which was just as amazing and funny as you think it was). So, thinking that her company probably has tickets often to events at the Nokia, I emailed her two weeks ago about getting tickets to see Stevie Wonder perform at “Stevie Wonder’s 16th Annual Full House of Toy Benefit Concert ft. Drake.” You know, if she happened to hear of any tickets lying around. “Oh Stevie!! He’s so amazing! !” she replied. Two hours later, I got another email from her. “Guess who is going to be in studio doing a private performance next Wednesday 11/30 at 8:30am?? Guess who got herself +1 on the list. Oh snap! Be my +1! 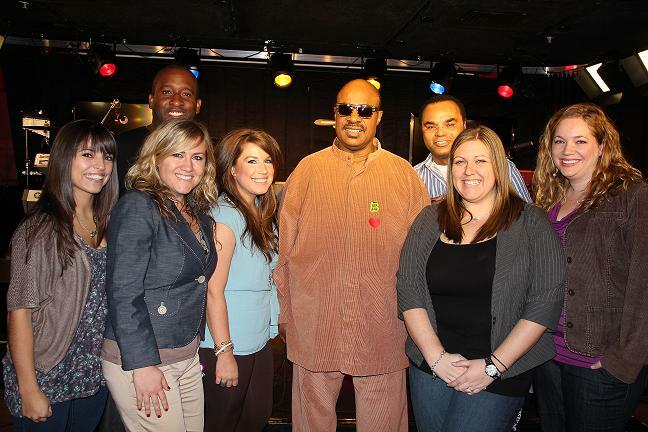 You’ll be seeing Stevie Wonder in a private in studio performance (less than 40 people) up close! Way better than a big show! It ended up being a small crowd of about 25 people, a lot of them employees of Clear Channel. I love it when employees, people who see the magic happen every day, are just as jazzed as regular Joes. It’s how you know something truly special is happening. “Yeah. Now that’s a song we can start with. Let’s play ‘Sir Duke,'” he said to his band. And then they played this song: Sir Duke. When introducing his bandmates, Stevie forgot about his percussion player. “Oh!” Stevie laughed, “I didn’t see him back there.” Get it? Stevie’s blind – of course he didn’t SEE him. Stevie was tickling the keys the whole time, even while chatting with us. It was something he seemed to do without thinking. And, of course, he always sounded great. What a great way to kick off this holidays season. Up next, Christmas Celebration at church and my golden birthday (29 years old on December 29th).